On Sunday 1st October, as the Conservative Party conference opens, there will be a mass demonstration organised by the People's Assembly. There will be a climate and fracking bloc organised by the Campaign against Climate Change and local groups. 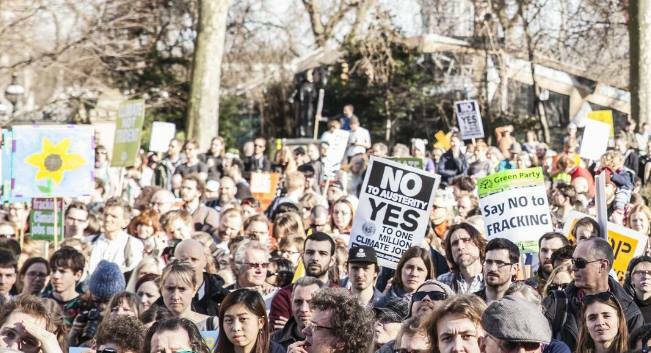 On Monday 2nd there will be a specific climate and fracking protest outside the conference centre, followed by a meeting later in the afternoon to plan future campaigning and discuss the issues. Details below - your support, particularly for the Monday events will be much appreciated. Please share! Fracking and climate campaigners will be meeting in Salford to form a feeder march to Castleford Arena, if you can, join them from 11am, if not, you can link up by waiting outside the Museum of Science and Industry on Lower Byrom Street to join up with the feeder march. Or look out for the bright yellow anti-fracking placards and banners in the Arena! Activists will be protesting at the Tory Conference between 1-3pm against fracking and lack of action on climate change. We will highlight a range of issues that the government is failing us on, from biodiversity to support for fossil fuels; road and airport expansion and lack of support for renewables. The meeting point is 1pm outside Central Library, St Peters Square, M2 5PD, then moving to find the best spot outside the 'ring of steel' at the conference centre- Manchester Central M2 3GX. If you're late, look out for the 'Mr Frackhead' puppet! This is an opportunity to raise the existential threat of climate change without it getting lost among other important issues. This will be an opportunity for activists to network and discuss campaigning priorities.